Trivelles Liverpool i Liverpool, England : Boka nu! 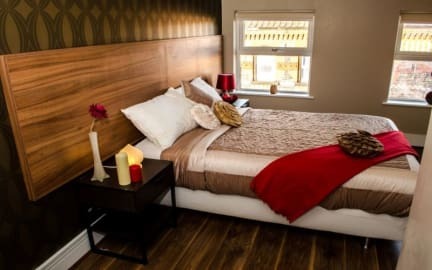 All of the rooms at Trivelles Liverpool are newly refurbished and equipped, for you to enjoy a great nights rest in a modern but comfortable environment. We hope you enjoy many of the rooms which all have en-suite wash room facilities and come at a great value for money. We are close to Merseyside Rails's Bank Hall station. By car, you can follow the A59 road heading up north from the city center, following onto Stanley Road. Alternatively bus 47 and 53 stop outside from the city center. Right on our doorstep on Stanley Road are a variety of shops and services for you, should you require, from hair dressers to grocery stores including buses to major towns. 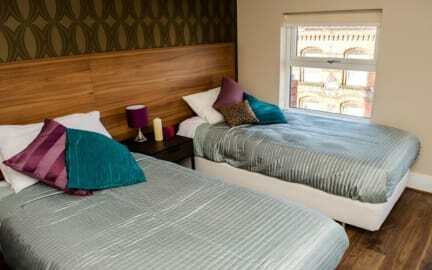 Trivelles Liverpool offers accommodation 5min from the city centre. It has newly built interiors with modern furnishings. We offer secure card door locks and free Wi-Fi access. Payment upon arrival by credit cards, debit cards (Visa, Mastercard only). - Strictly no smoking within the hotel, any guests caught smoking may be expected to pay a fee.